An absolutely beautiful flowing organza/voile layered smocked white dress by Will'Beth. The entire chest of the dress is smocked and embroidered with white bullions and rosebuds. 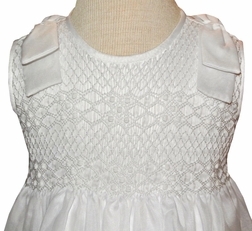 The shoulders are embellished with white fabric bows. 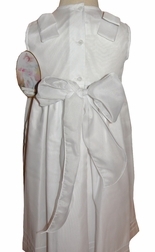 Perfect for flower girls, Christening, graduations, First Communion and Portraits.